Goalkickers: J.Howell 3, J.Mills 2, F.Davies 1, L.Kerr 1, B.Milroy 1, J.Spencer 1, K.Warbuton 1. Best: A.Hodgson, J.Mills, B.Milroy, F.Stafford, L.Kerr, J.Howell, F.Davies, J.Spencer, J.Conley. Reports: Nil Injuries: Brown (bruised ribs) replaced by Guy second quarter. Mills (wrist). 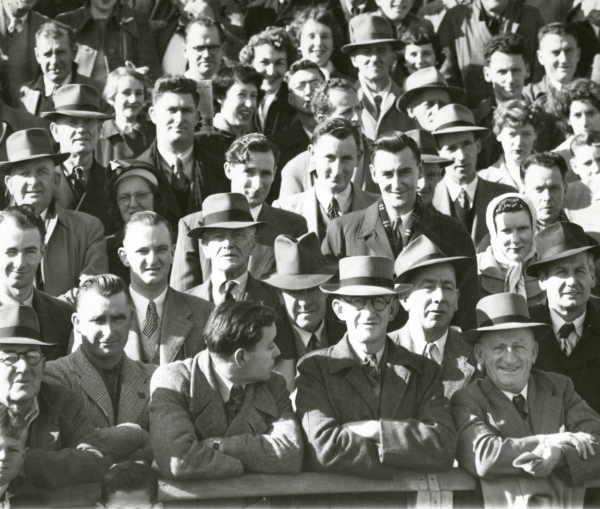 Crowd at the South Melbourne vs Carlton game at the Lake Oval. Down by 23 points at three quarter time, and aided by the wind in the final term, Carlton scored 1.6 in the first 15 minutes of the quarter with "(Jack) Spencer frittering way golden opportunities that could have clinched the game for Carlton." Eventually, Keith Warburton goaled to reduce the lead to 15 points, then the Blues squandered another four easy chances. With time running out, Bill Milroy snapped truly to make the difference only six points, before Fred Stafford got the ball from the centre to Jack Howell - whose long, driving drop-kick scored the vital goal to force a draw in the last two minutes. Laurie Kerr and Arthur Hodgson gave the Blues plenty of drive from the wings, and nippy rover Jack Mills scored two valuable goals. Milroy at centre half-forward got on top in the third quarter, while 'Chooka' Howell dominated the rucks. South's Don Earl was reported for allegedly striking Spencer. Contributors to this page: blueycarlton , Bombasheldon , PatsFitztrick , molsey , Jarusa , WillowBlue , camelboy , steve and admin . Page last modified on Wednesday 16 of October, 2013 23:24:20 AEDT by blueycarlton. 1985 - Laughing the Blues way (23/05/85).